A free, web-based source of support and information about non-coercive, interest-led, home- and community-based, learner-directed education for all ages (also known as life learning, unschooling, natural learning, and free-range learning). 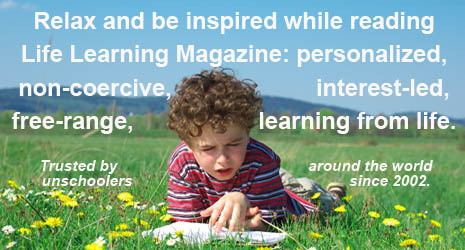 Life Learning Magazine was founded in 2002, so there are currently about 400 articles on this site. Our goal is to make our complete archive available on this website, in addition to all the newly published articles that we are adding on a regular basis. Check them all out here. The Importance of Context - When we entrust the learning process to the learner, they naturally select what holds meaning for them and disconnected boredom is eliminated. Read more. The Power of Authority - One of the challenges for life learning parents is to overcome the influence of authority - of schools, education experts, & homeschool leaders, or over our own children. Read more. Learning and the Power of Storytelling - Long before the beginning of formal education, storytelling was the means for passing information and wisdom from generation to generation. Read more. Because It Was the Right Thing to Do - We can educate and parent with trust and respect because it is the right thing to do, rather than to fulfil a parental agenda for our children. Read more. Healing Forward: On Becoming a Peaceful Parent - We can become more peaceful parents by healing our childhood wounds, thus breaking a dysfunctional cycle. Read more. Who Is My Child To Be? - As home educators, we can be scientists, free to figure out what works with our children, with our families, in our communities – in spite of our own preconceptions. Read more. A Sense of Wonder - As adults, we need to make the time to develop our own Nature connection and to nurture our own sense of wonder, in order to share that with our children. Read more. What is Education For? - A grown life learner believes that education means looking for truth, testing beliefs, making choices...and having fun. It also involves learner choice based on interest. Read more. Supporting Children to Live and Learn Without Coercion - An unschooling mother of teens describes how they came to life learning, and how and why living and learning without school works. Read more. Coercion, Compulsory Attendance, and Adultism - Why the use of the term self-directed education is not compatible with compulsory attendance at a school. Read more.